The first shipment of IGP-certified oranges from Frutas Tono of Spain is expected to arrive at Shanghai Huizhan Wholesale Fruit Market in the coming days. For a first-hand account of the arrival, Produce Report interviewed Mr. Juan Bautista, Export Manager at Frutas Tono, and Mr. Dawud Bai, General Manager of Fruitceo and the agent for Tono oranges in China. Spain is the leading producer and exporter of oranges in the European Union. Its geographic location and mild Mediterranean climate make Spain perfect for citrus cultivation. Moreover, precision mechanization has been extensively applied to almost every aspect of the Spanish citrus industry, allowing its citrus products to be even more competitive in the international arena. Located in Valencia, a major global orange-producing region, Frutas Tono boasts a time-honored history in growing citrus and enjoys a good reputation for quality in Europe. The company started exporting oranges to China in 2015 and now Tono oranges are recognized and prized by China’s fruit industry for their juiciness and good balance between sweetness and sourness. "IGP" stands for Indicación Geográfica Protegida, or Protected Geographical Indicator (PGI) in English. According to Mr. Bautista, to be granted the certification, citrus produced in Valencia has to receive approval from a committee consisting of citrus growers, exporters, and governmental officials, which assesses the fruit from the very beginning of production to final packing. The stringent requirements that comprise IGP certification ensure that only the highest quality oranges make it to China’s markets. Mr. Bai told Produce Report that exports of Spanish oranges to China have experienced significant increases over the last few years. However, with this increase in popularity in China have also arisen new problems and issues. "Some oranges which haven’t been handled properly at various stages, such as during precooling, grading, and packing, have also been shipped to China. Even worse, some irresponsible exporters have brazenly brought counterfeit Spanish oranges to China, which were actually inferior oranges sourced from neighboring countries. As a result, the reputation of Spanish oranges has been severely damaged." 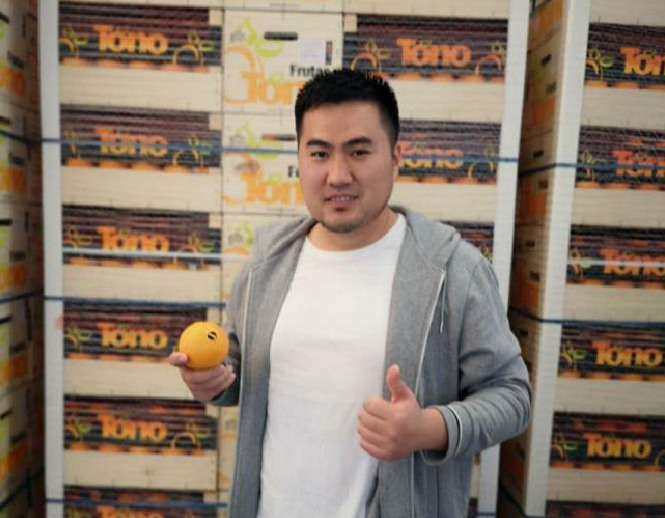 Mr. Bai also noted that, as this is the fifth year Tono oranges have been available in China, “The brand now represents premium oranges from Spain with a quality that can be trusted. 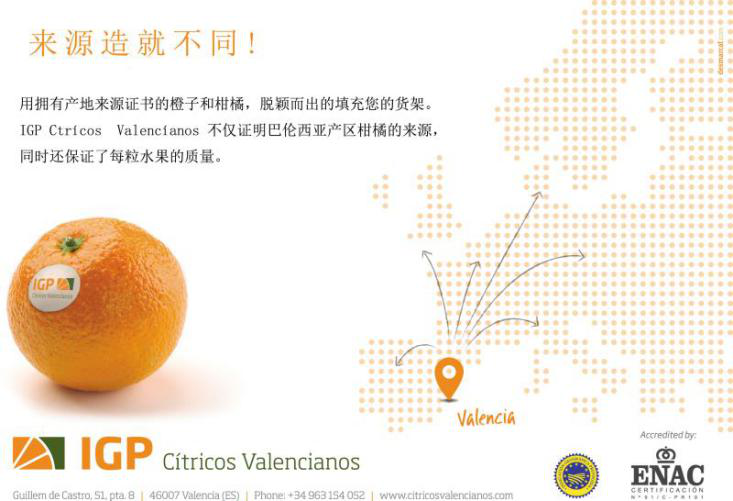 We hope IGP certification will further distinguish Tono from other oranges in China as a natural treasure from Valencia." 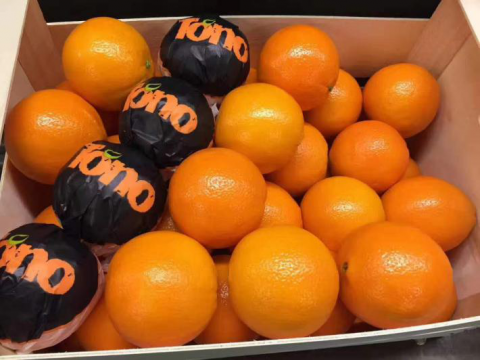 In order to support IGP-certified Tono oranges in China, a series of promotional campaigns targeted at consumers, wholesalers, and retailers will also be launched in the near future.